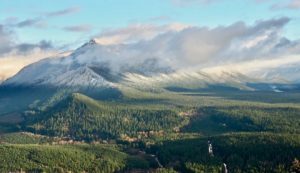 Clad in a wintry mantle and streaming clouds, Mount Washington rises dramatically from the surrounding lowlands in this view from Rattlesnake Ledge. December 30, 2016. A bastion at the edge of the Cascades, Mount Washington is one of the first peaks encountered east of Seattle, Washington. 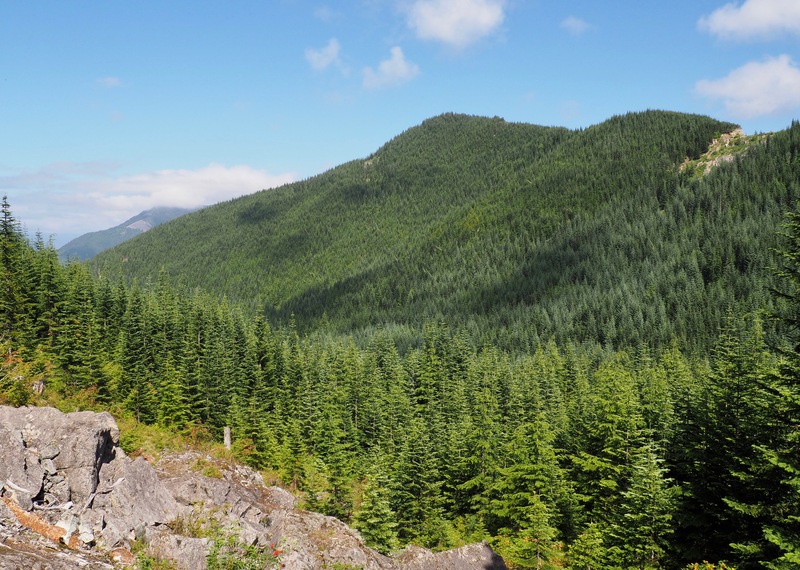 Previously stripped of forest by logging and wildfires, Mount Washington is now cloaked with woodland in varying stages of recovery. The rocky trail begins in a dim corridor of close, deciduous forest and climbs steeply for approximately half its distance before relenting in its grade. As the trail enters young conifer plantings, views open increasingly until it reaches the summit’s summertime display of wildflowers and sweeping lake and mountain vistas. From the parking area, a spur trail and then a gravel spur road lead a short distance to the Iron Horse Trail (also called the John Wayne Pioneer Trail), the former route of an old railroad between Chicago, Illinois and Tacoma, Washington and now a wide gravel trail popular with local walkers, runners, and cyclists. Signage is sparse and confusing — turn right onto both the spur road and the Iron Horse Trail. In a scant few hundred feet/120.0 km, the poorly marked trail to Mount Washington branches left from the Iron Horse Trail. 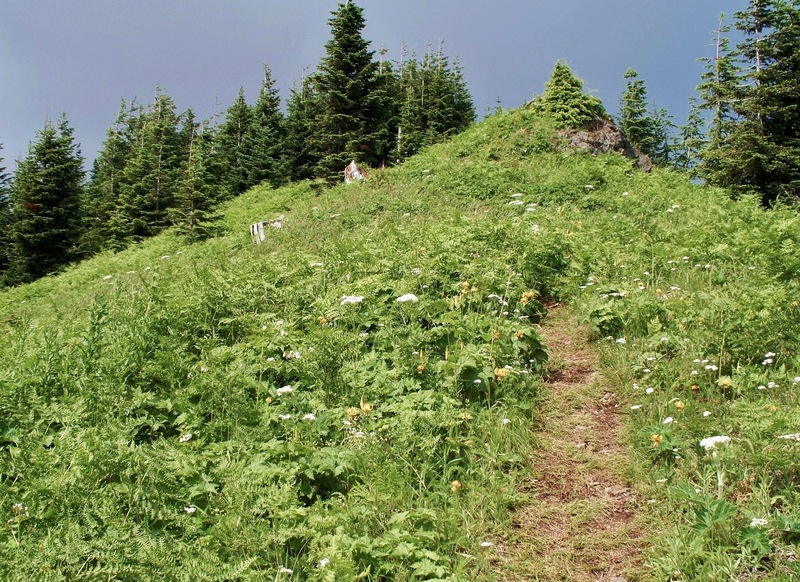 Several false trailheads also lead left from the Iron Horse Trail — look for small stone cairns and a message scratched into the bark of a tree to identify the trail to Mount Washington, as shown below. Walled with leafy forest of mostly red alder (Alnus rubra), the spur trail from the parking lot is characteristic of Mount Washington’s trail at its lower elevations. The spur road and Iron Horse Trail are generally nondescript gravel roads. The trail up Mount Washington is one of several that branch from the Iron Horse Trail, most apparently leading nowhere when followed but a short distance. Iron Horse Trail, May 25, 2015. 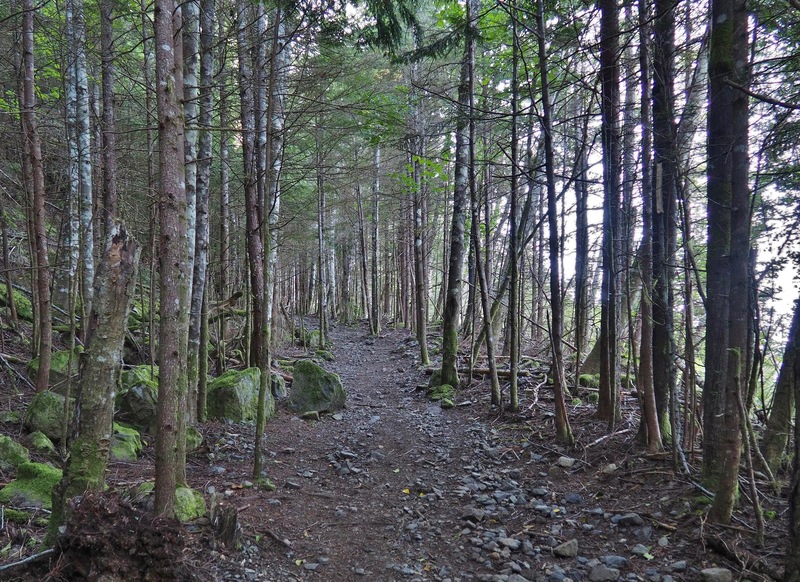 The trail to Mount Washington is marked by an easily toppled cairn and bounded by two small red alder trees (Alnus rubra). 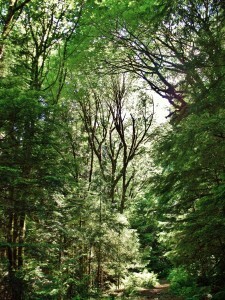 The alder on the right of the trail bears the small, carved inscription “Mt. WA” (which incidentally illustrates why this otherwise un-red tree bears that color in both its common and scientific monickers). 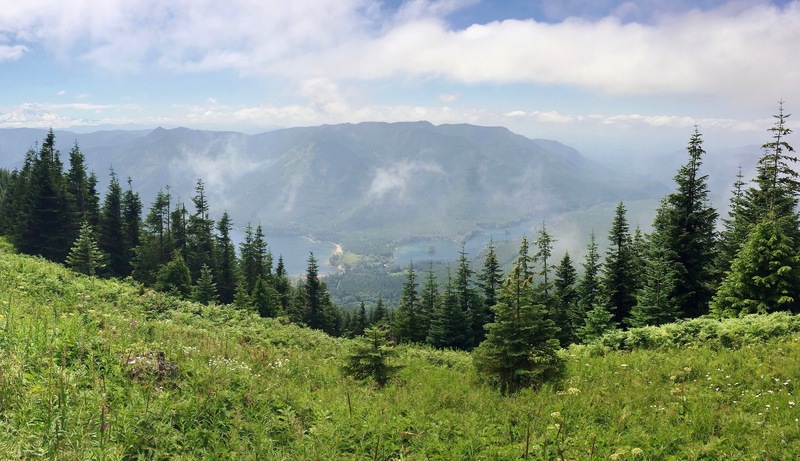 Iron Horse Trail/Mount Washington Trail, May 25, 2015. 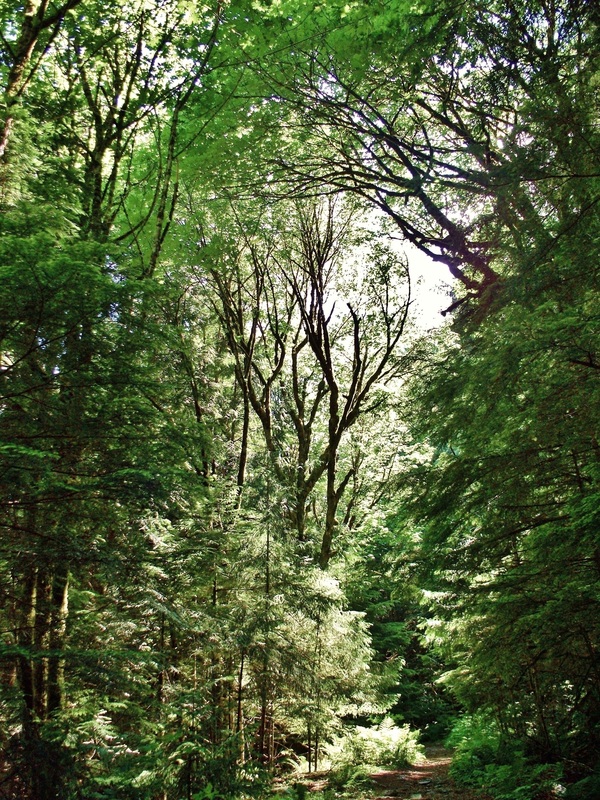 Sunlight dappled through soaring boughs beckons as leafy, deciduous forest closes about the lower trail. Mount Washington Trail, July 09, 2009. The trail passes several stony outcrops, some adorned with ferns and vibrant lichens. Mount Washington Trail, July 09, 2009. As the trail climbs, spindly young conifer forest fences much of its stony ascent. Mount Washington Trail, July 26, 2016. 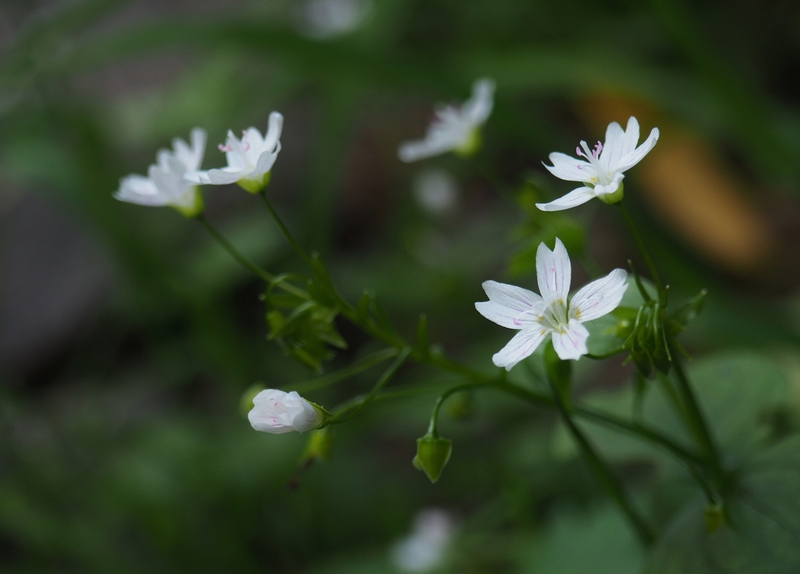 Throughout the shadowy woodland where little else blooms, starry-eyed Siberian springbeauty (Claytonia sibrica) brightens the forest floor. Mount Washington Trail, July 30, 2016. Here and there, windows in the forest offer peek-a-boo views of other mountains beyond. 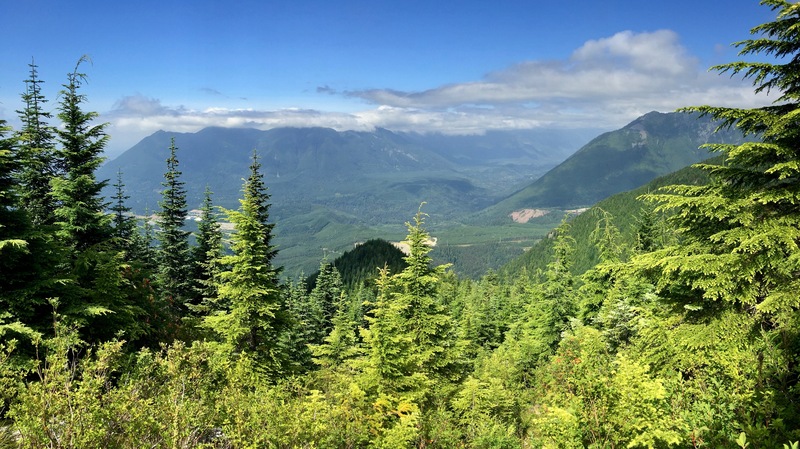 To the west, Rattlesnake Mountain rises above the outer reaches of North Bend, Washington. (Don’t worry, the name is a misnomer – there are no rattlesnakes on the west side of the Cascades.) Mount Washington Trail, July 09, 2009. 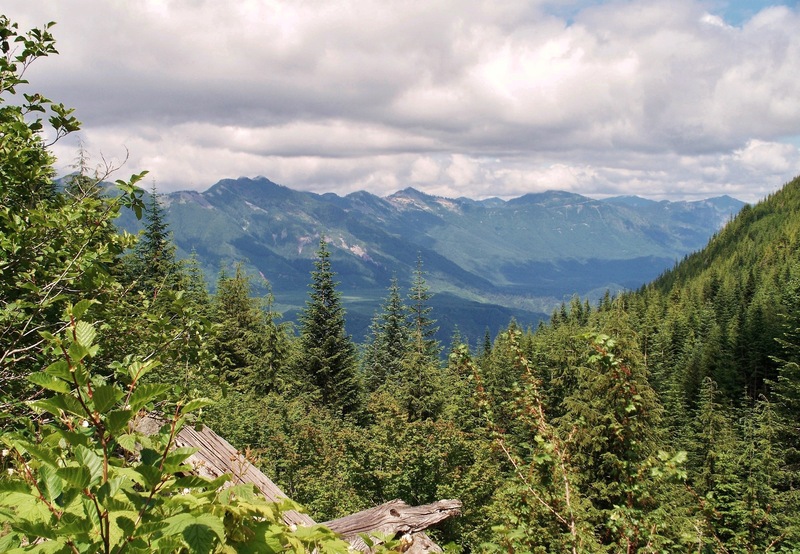 To the northeast, the forest opens to a view up the Middle Fork Snoqualmie River Valley. Mount Washington Trail, July 09, 2009. 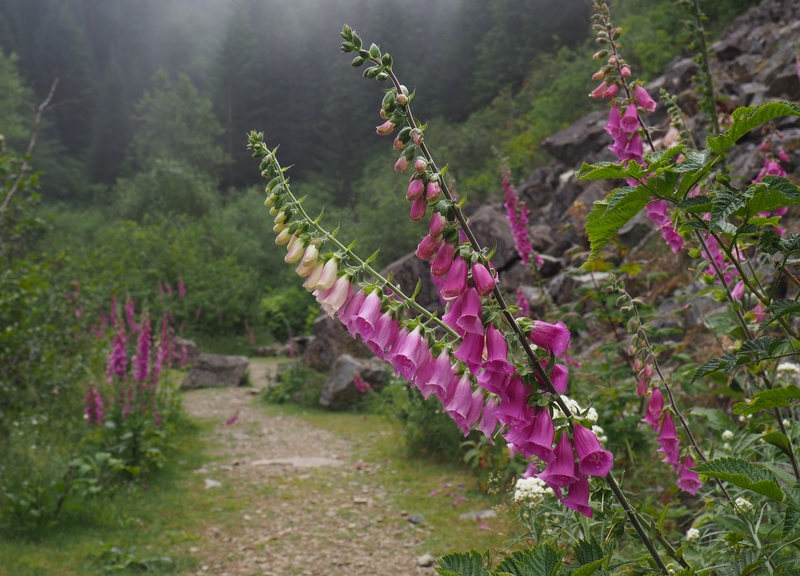 Foxgloves’ (Digitalis purpurea) lolling bells dangle from a rocky meadow in one of the forest’s only clearings along the trail. Mount Washington Trail, July 30, 2016. At approximately 2.80 miles/4.50 km from the trailhead, the trail appears to end at a gravel road, but continues approximately 200 feet/60 meters up the road to the left. Informal and less than permanent signage indicates the direction to the next section of trail — look for cairns, sticks, and handwritten notes left by other hikers. Mount Washington Trail, July 26, 2016. Where higher elevation slows the new forest’s growth, views open down the mountain valley. Mount Washington Trail, July 30, 2016. 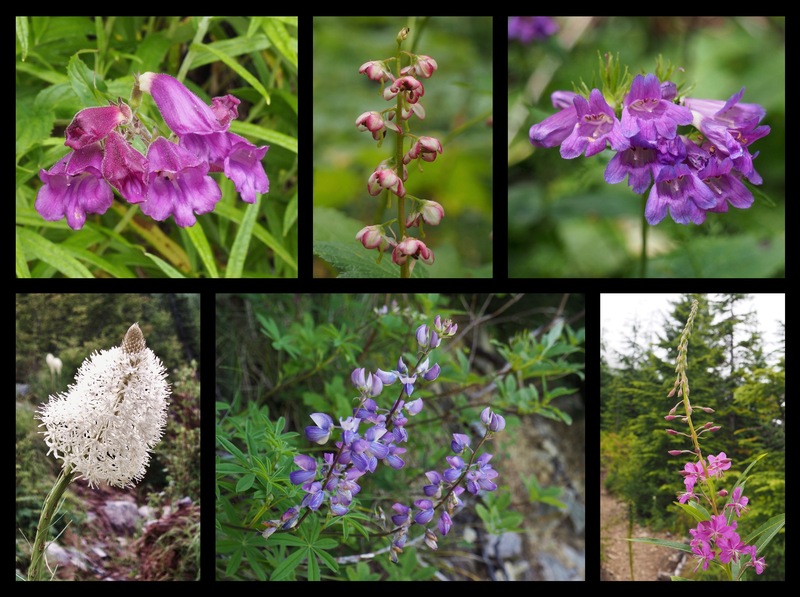 As the trail climbs, a few summer blooms appear where the stunted forest opens, including, clockwise from top left, woodland penstemon, or, woodland beardtongues (Nothochelone nemorosa); liverleaf wintergreen (Pyrola asarifolia); Cascade beardtongues (Penstemon serrulatus); fireweed (Chamerion angustifolium); lupine (Lupinus sp. ); and beargrass (Xerophyllum tenax). Mount Washington Trail, July 09, 2009 and July 30, 2016. 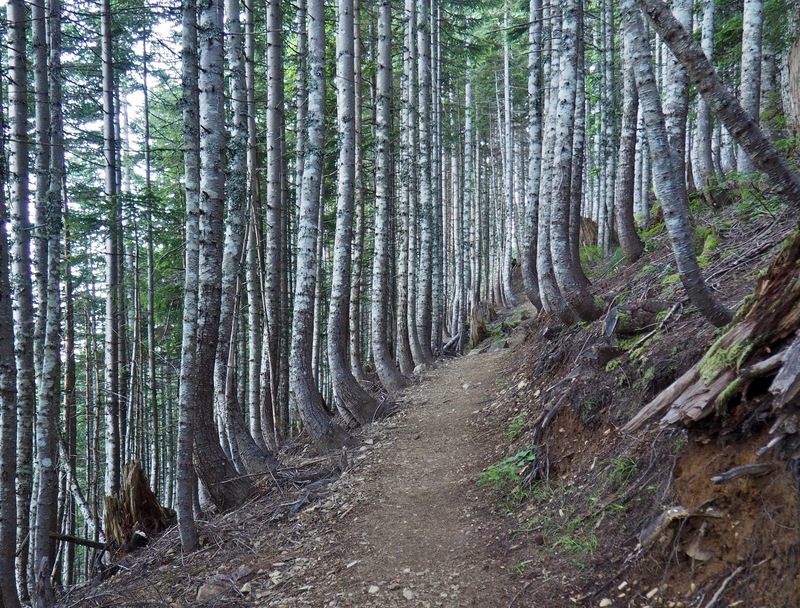 Just below the summit, forest again encloses the trail and slender tree trunks pinstripe the surrounding mountainside. Mount Washington Trail, July 26, 2016. At the trail’s final switchback, the woodland gives way to a burgeoning, steeply pitched meadow. Mount Washington Trail, July 09, 2009. 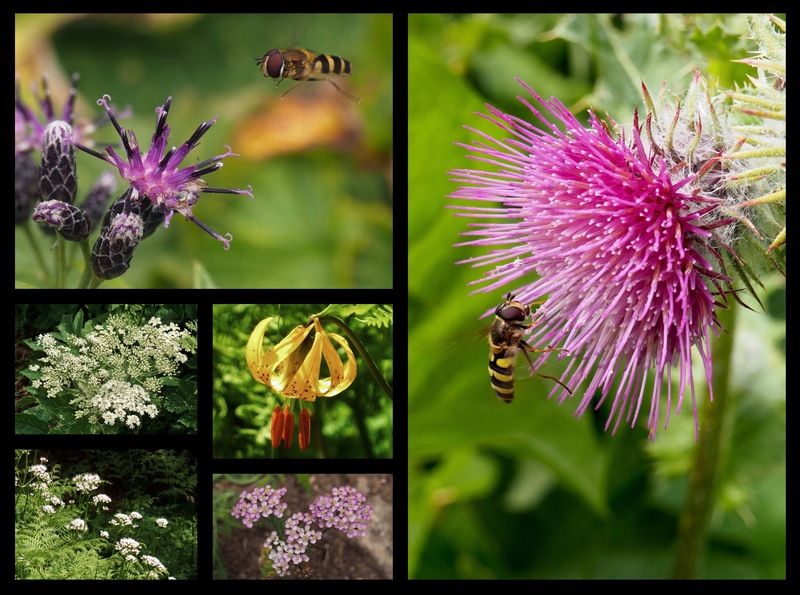 In the mountaintop meadow, look for American saw-worts (Saussurea americana) (top left); edible thistles (Cirsium edule) (right); cow parsnips (Heracleum maximum, a.k.a. Heracleum lanatum) (center left); Columbia lilies (Lilium columbianum) (center); Sitka valerians (Valeriana sitchensis) (lower left); and common yarrow (Achillea millefolium), in both its standard white and less common rose variations (lower center). The insects pictured here are not bees, but hoverflies (Syrphidae), which mimic bees’ markings for protection from predators. Mount Washington Trail, July 09, 2009 and July 30, 2016. 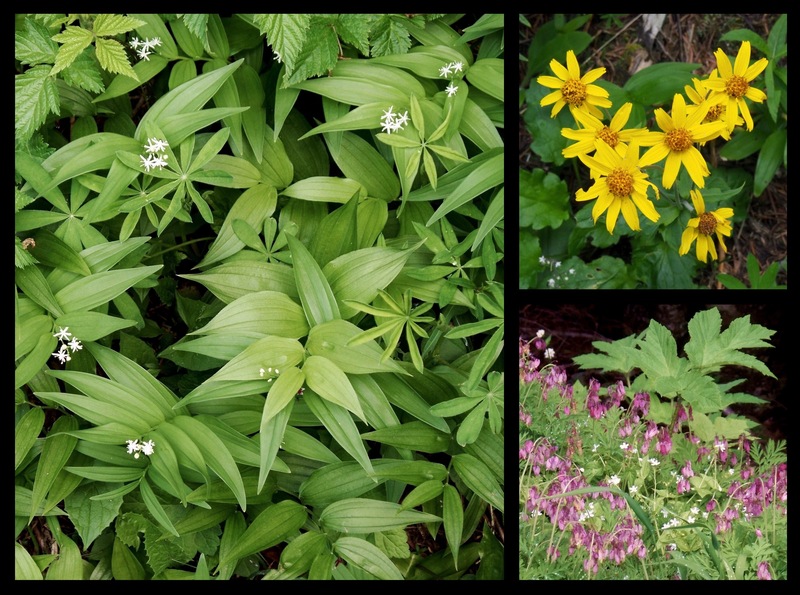 Around the meadow’s shaded edges, look for shade-loving star Solomon’s seals (Maianthemum stellatum) (left); heart-leaf arnicas (Arnica cordifolia) (top right); and Pacific bleeding hearts (Dicentra formosa) (lower right). 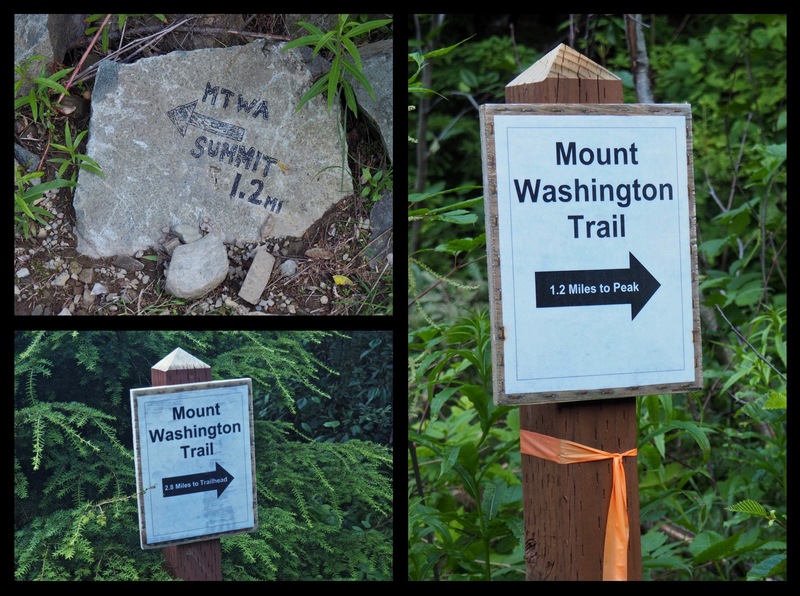 Mount Washington Trail, July 09, 2009 and July 30, 2016. On a cloudless day, Mt. 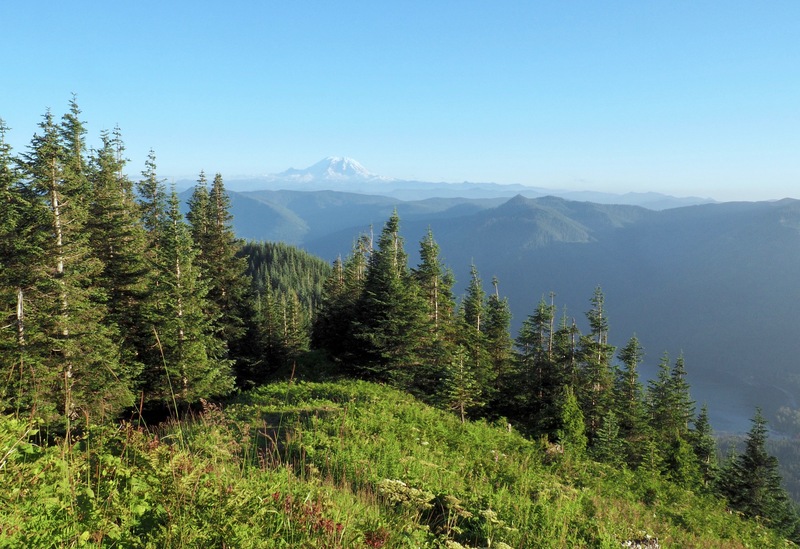 Rainier greets sight just as the trail clears the forest. Mount Washington Trail, July 26, 2016. Beyond the slowly rising forest, the mountaintop clearing affords a bird’s-eye glimpse of Chester Morse Lake and Masonry Pool, which were created by damming the Cedar River and inundating what was once Cedar Lake to supply water to Seattle, Washington. Little Mountain and Mount Lindsay rear from the lakes’ far shores. Mount Washington Trail, July 30, 2016. Mount Washington’s northern view scans the ridge comprising Mount Si, Mount Teneriffe, and Green Mountain (here, in the left and center background) and Mail Box Peak rising at the juncture of the South and Middle Fork Snoqualmie river valleys (here, in the right middleground). Mount Washington Trail, July 30, 2016.